This function allows the users to create a Tuition Groups. All students within Brunei are split into logical grouping called Tuition Groups. These groups are created based on the academic career of the student. E.g. Primary, Secondary or 6th Form. Navigate to Main Menu > Setup SACR > Product Related > Student Financials > Tuition and Fees > Tuition Groups. Enter the values in the Business Unit and Tuition Group field. Note: Tuition Group is the academic career. E.g. key in Primary, Secondary or 6th Form. You will be directed to the Tuition Groups page. In the Definition tab, enter the values in the Effective Date, Description, Short Description, Long Description and the Priority fields. Also, tick the checkbox for the Tuition Calculation Group. Note: Priority the Effective Date should be set as 01/01/1901. Effective Date: It is set as 01/01/1901. Status: Status has to be Active before any calculations can be done. Description: Describes briefly on the Tuition Groups page. Priority: Use the Magnifying Glass icon to search for the required priority level. Note: Make sure the required field are not empty: Effective Date, Status, Description and Priority. In the Adjustment Codes tab, fill in the values in the Pro-rata and Federal Refund fields. 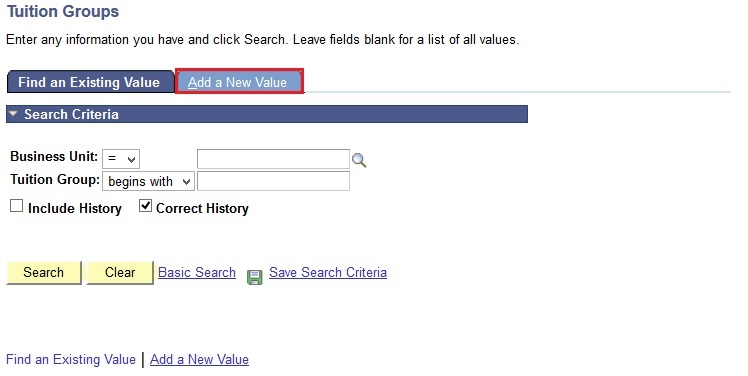 In the Criteria tab, fill in the value in the Criteria / Equation field. Note: Click the magnifying glass to choose the criteria which depends by the school to set. Lastly on the Term Fees tab, enter the value in the Fee Code field. Note: Click the magnifying glass if you don't know the Fee Codes. Also, click the '+' button if you want to add another Fee Code or click the '-' button to delete the information.